The low-profile motor from Grifco is suited for high cycle light commercial sectional doors up to 15m². Designed for high cycle, light commercial sectional doors up to 15m², the Grifco S-Drive is suitable for small carparks typically found in smaller apartment buildings. 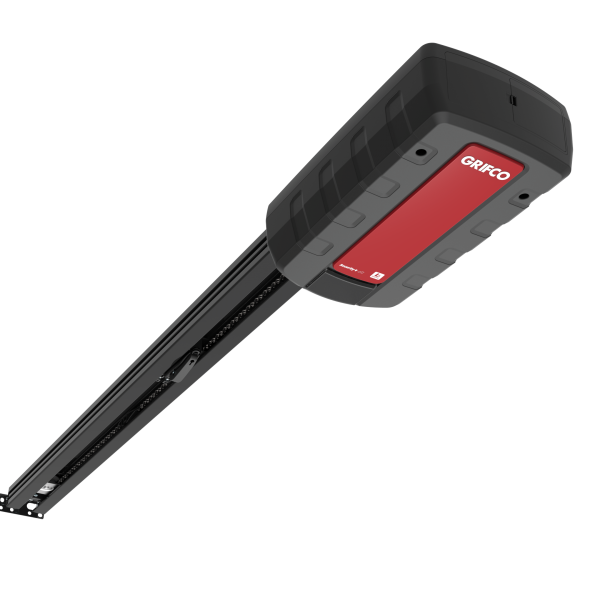 The Grifco LS-Drive has been built to lift spring-balanced sectional doors and grilles up to 50 times per day. With easy logic configuration, this motor can be configured as “open-only” and “timer-to-close” which is ideal for multi-user carpark applications. Available in two different lengths of 2.4m and 3.0m, the extremely durable extruded aluminium rail can be easily surface mounted for low ceiling carparks and features a clever mounting method and integrated cable management. The extrusion allows for safety beam cables to be tucked in the side walls of the rail, preventing the need to cable tie or manage loose wires. Included accessories supplied with the Grifco LS-Drive are monitored safety beams (required for operation) and the Grifco 4-channel transmitter. The Grifco LS-Drive is backed by a 12 month / 20,000 cycle warranty, covering the high-cycle workload of a busy sectional door.